Bryan Singer continues his Twitter love affair from the set of X-Men: Days of Future Past. From the first photo of Jennifer Lawrence in full makeup to what could be Quicksilver’s house, the director has clearly been having fun teasing fans of the X-Men franchise. His latest Twitpic could be his best. 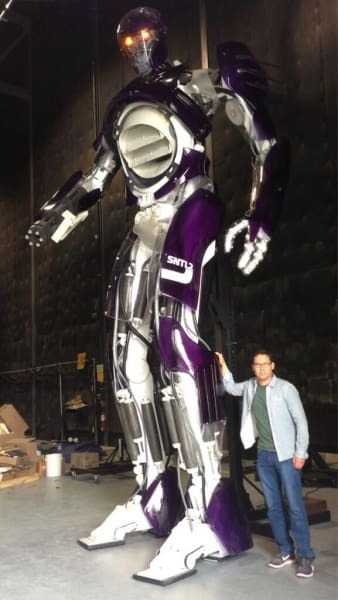 Singer is standing next to a full-size Sentinel on the set of his epic. The entire X-Men: Days of Future Past cast truly could not contain their thrill at being able to work together at Comic-Con recently. And it is easy to see why. When your helmer loves his work as much as it is clear that Singer does, then the actors will obviously be enjoying the daily grind of filming a blockbuster movie as well. And you know what they say: If those on and behind the camera are having fun… so too will the audience. So, then prepare to have an utter blast when X-Men: Days of Future Past lands in theaters May 23, 2014.